I had a ton of childhood photos for my mom, so for her I repurposed our Scattered Baby Girl Moments Baby Announcements that featured a lot of photos, with room on the back for my instructions. 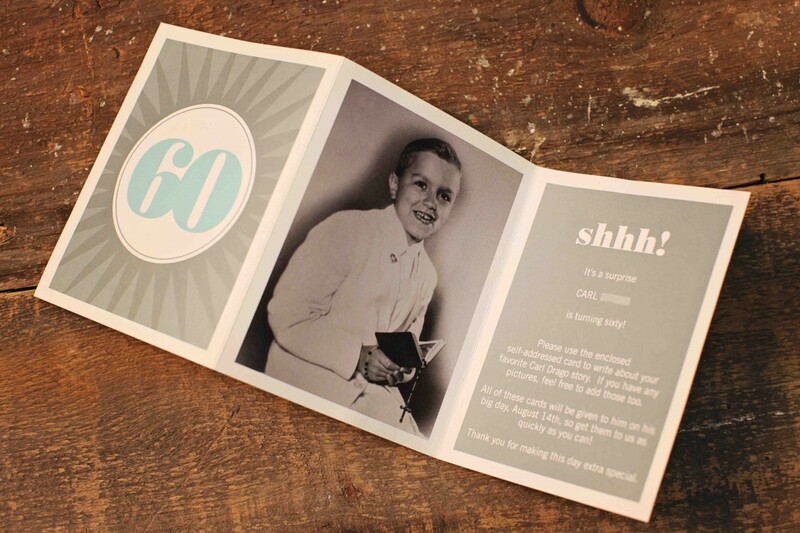 I felt less comfortable shouting to the world that she was 60, so I just slyly called it a ‘very special birthday.” As I did with my dad, I asked people to write a note to my mom telling her their favorite memory. The note cards I enclosed were our Picture This Photo Wedding Thank You Cards, also repurposed for a birthday and customized in colors to match the bigger card. Over the next few weeks, I started getting piles of letters and gifts back. It killed me not to be able to open any of them! Then, on their birthdays, I packaged up all the letters and gifts and gave them to my parents. Both got letters from colleagues, friends, and family. My mom got a card from a colleague with whom she car-pooled with for many years. This friend had counted the miles they drove together, and it was over a hundred thousand miles! She also got a card from her niece thanking her for introducing her to the sport of tennis. This niece eventually reached the state championship! Each of my parents received letters that brought tears to their eyes. My mom described, after reading the letters multiple times over, how surprised she was at the sheer quantity. I was so happy to see how touched they were by this outpouring of wonderful memories. And I was proud of my parents, seeing the impact they had made on so many people’s lives. I’d have to say, my birthday party ideas were a complete and total success! Choose your BIG card first, the card that tells the recipients what you would like them to do. Choose your SMALL card, the blank card that recipients will use to write their stories. Just remember that this note card and its envelope will have to fit inside the envelope of the bigger card. Order matching address labels with YOUR name on them, enough for both the small envelope inside that they will mail back to you, and for the larger envelope that holds everything. Put your address labels on the front of the small envelopes so guests don’t have to address them. It’s also nice to put stamps on them. Send them out! I chose to send them out 4-5 weeks before their birthdays. Collect as many addresses as you can of your friend’s friends, colleagues, and family. You probably won’t have all the addresses you want, but I reached out to a couple ‘key’ people from my mom’s tennis group or my dad’s workplace, and asked them if they’d pass them out to friends. That worked really well! Watch the cards flood into your mailbox! Since you’re requesting that all these letters come to YOU, you then have the task of guarding them with your life until you can present them to the birthday guy or gal! Of course, you can also have them send their notes directly to the birthday honoree, if you don’t want to present them all at once. 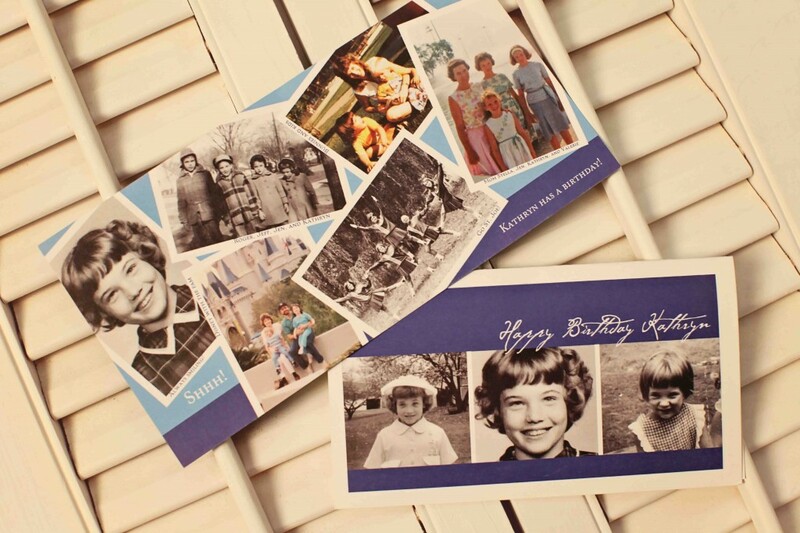 We have lots of great birthday invitations and note cards at Pear Tree Greetings that will fit any type of birthday party, so happy shopping! And keep reading our blog for more great birthday ideas. Stephanie is the General Manager for Pear Tree Greetings and when she’s not leading this oh-so brilliant team, she enjoys her time with her husband and kids at home. Her kids, at the adorable ages of 4 and 2, have kept her on her toes lately by painting the walls with crayon and washing her makeup down the sink days before going on air at Twin Cities Live.